The Scamold ERA (no. 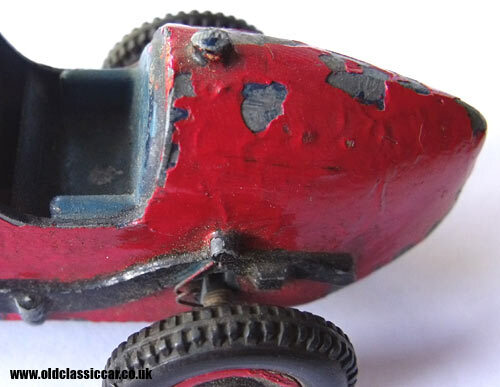 101) toy racing car of the 1930s. 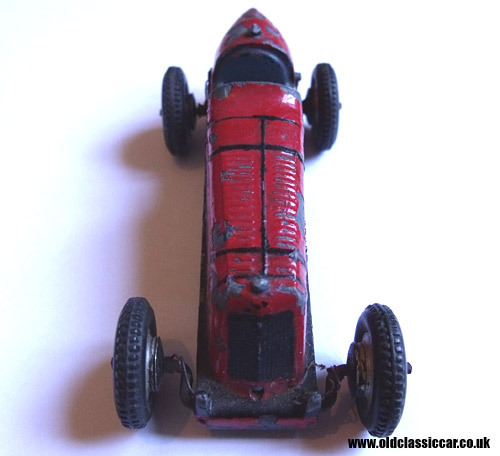 An original Scamold metal kit of the ERA racing car. Although it needs restoring, I bought this some years ago as it was the first Scamold (Scale Models Ltd) that I'd ever clapped eyes on at a toy fair. 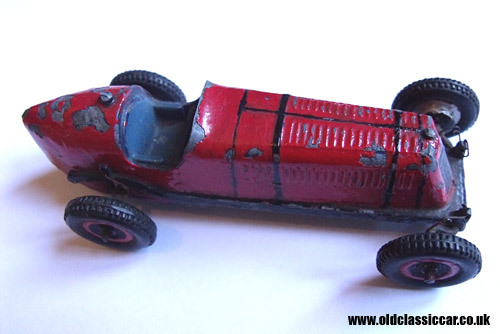 It was originally sold as a metal kit of the ERA single seat racing car, code number 101. Although missing a few parts (such as the steering wheel, and the exhaust that should run along the lefthand side of the car's bodywork), it seemed like a good buy. Original Scamolds turn up from time to time, but much more common are the modern reproductions. Code 101 was the ERA as seen here, No. 103 was a Maserati, and No. 105 an Alta, as far as I can ascertain only these three racing models were put into production by Scamold. The range of cars was put on sale in 1939, based on actual cars that had seen action at Brooklands. 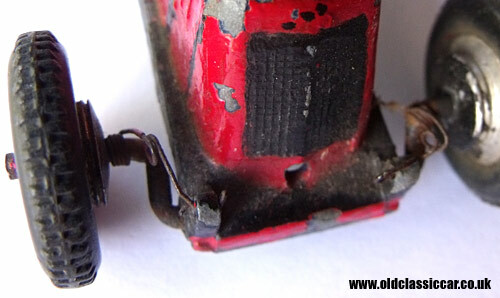 The quality of the die-cast bodies is really quite good, although not to clear on my badly-painted example, the letters "ERA" can be made out on the tiny badge above the car's radiator. Early cars had brass wheel hubs, whereas later examples - such as mine - had aluminium hubs instead. Working suspension is fitted to all four corners, this comprises a thin wire wound around the axles, and can hopefully seen in the images above. Some came with a standard back axle, while others were sold with a clockwork motor that could be installed at the rear for added excitement. The starting handle up front took care of winding up the rear-mounted motor. Production of the cars continued until 1950. The ERA measures approximately 4.5 inches in length.